>>Download the biography - Short version. 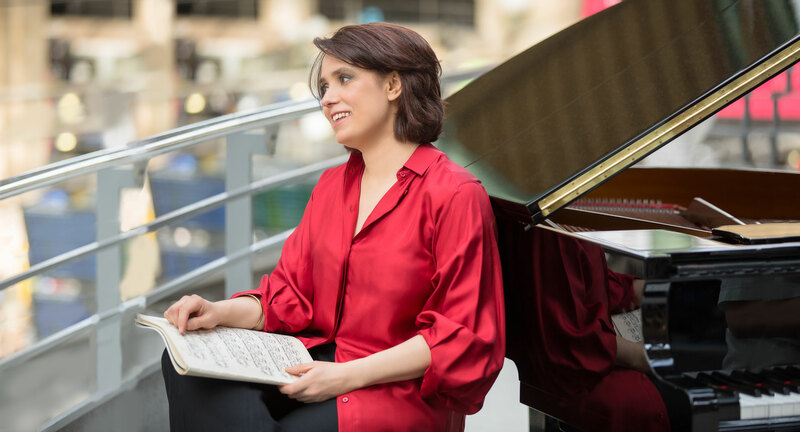 French-Canadian pianist Marie-Laure Boulanger, recognized at a very young age by Pierre Sancan, benefitted equally from the teaching of Jean-François Heisser and André Gorog in France, and internationally from György Sebök, Gary Graffman, and Craig Sheppard. In 1991 she was awarded First Prize in Piano (while in the class of Jean-Claude Pennetier) and also the Chamber Music Prize (while in the classes of Roland Pidoux and Christian Ivaldi) from the National Superior Conservatory of Paris for Music and Dance. She then pursued post-graduate studies at the Royal College of Music, London, with Yonti Solomon. Marie-Laure Boulanger is a well-rounded musician who obtained a Diploma in Orchestral Conducting (while in the class of Stéphane Cardon, CRR de Douai) in 2010, and continued advanced tuition in composition and orchestration in the classes of Dominique Rouits and Michel Merlet. In 1997 she recorded her first solo CD followed by a Beethoven CD with the Concorde Trio. Today, Marie-Laure Boulanger pursues an international career giving solo or chamber music recitals as well as performing as a soloist with orchestra. In France she has played in various venues and cities such as Salle Pleyel and Salle Cortot in Paris, the Avignon Festival, Montpellier, and the Halle aux grains in Toulouse. Internationally she has performed throughout Europe, in Canada and the United States, and in China. She has given numerous concerts and interviews for radio (eg for France Musique, a special broadcast on Lili Boulanger...) and television. She has received a number of distinctions such as First Prize of the CMF Guérande International Competition, the Beethoven Prize, and the Jean Racine Prize among others. Marie-Laure Boulanger has been, since 1995, a permanent piano and chamber music teacher at the Conservatory of the 9th District in Paris, and has been invited to give master-classes in France and in other countries such as the USA and Holland. In 2007 she created the Piano Cantate Association which is musically orientated towards the rediscovery of 20th Century French works as well as performing new contemporary works. The Association also organises workshops, concerts and cultural events. The CD Reflets, chamber music by Debussy and Ibert, with Magali Léger, soprano, Françoise Douchet, viola and Thiery Durand, flute, was released in 2013 and is the first opus produced by the Association. A second CD with the same instrumentation but featuring Liszt and Lili Boulanger is scheduled to appear during 2019.